Guillermo Del Toro and His “At The Mountains Of Madness”!!! Recently, Guillermo’s huge epic film, “At The Mountains Of Madness” he has been wanting to make was pulled by Guillermo at Universal for reasons that the studio wanted the film to be a PG-13, when Guillermo wanted the film to be an “R” rating. The film was going to have a $150 million dollar budget and have an “R” rating. 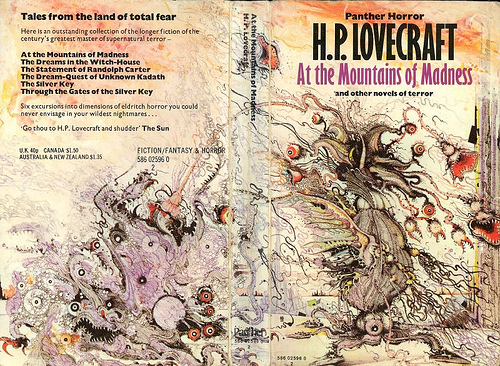 The film is based on the H. P. Lovecraft novella about scientists who come across malignant, mutating aliens during an expedition to Antarctica. Universal gave money to Guillermo for pre-production creature designs, but remained unwilling to give the big “greenlight” for Toro to actually start making the film. this is mostly in part due to the film’s giant budget and “R” rating. Guillermo said that he would not compromise on the rating stating that it’s not about the gore, but more about the artistic freedom to make the film really uncomfortable and nasty. He was hoping that this film would mark a golden age for films. Universal said the film would need to make $500 million dollars to make a profit. Now over at Deadline, there is an excellent interview with Guillermo about the whole debacle where he discusses his disappointment in not getting the greenlight to make “Madness”. Not all is lost, since his project, “Pacific Rim” already has the go ahead and will begin shooting very soon. This entry was posted on Wednesday, March 9th, 2011 at 2:57 pm	and is filed under Film, News. You can follow any responses to this entry through the RSS 2.0 feed. You can skip to the end and leave a response. Pinging is currently not allowed. « Stallone Might Let Someone Else Direct and write His Expendables Sequel!! !